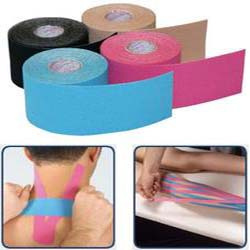 Kinesio Taping® is a specialized method for therapeutic and rehabilitative taping. Kinesio Tex Gold® is a specialized elastic, latex-free tape that takes minimal time to apply, is resilient (lasts up to 3-5 days), water resistant and suitable for patients of all ages. Kinesio Taping® is designed to reduce pain, reduce swelling, enhance performance, re-educate the neuromuscular system, prevent injury, and promote lymphatic flow. Kinesio Tex® tape was used by athletes from all over the world (www.kinesiotaping.com to see more on Kinesio Taping® at the Beijing Olympics). How does the Kinesio Tape® work? The Kinesio Tex® tape has the unique ability of lifting the skin (epidermis) which results in a decrease in pressure within the dermis, the layer of tissue underneath the skin. This is significant because the dermis contains blood and lymph vessels as well as neural receptors which are responsible for sensing pain and movement. This decrease in pressure creates an increase in space which allows for an increased blood flow and lymphatic drainage. The nervous system components within the dermis are also affected. The Kinesio Tex® tape provides gentle sensory stimulation to all sensory receptors. The tape can therefore have the effect of blocking the sensation of pain (nociception) as well as stimulating fine motor control of musculature(mechanoreceptors). In essence this means decreased pressure leading to decreased pain and an improvement in muscle function. applied by a practitioner depending on the specific condition intended for treatment. These various applications enhance the ability of the tape to address musculoskeletal issues. Finally, the durable nature of the tape allows for it to remain in its therapeutic applicative position for 3-5 days. Kinesio Taping® application can adapt to any range of motion the patient may require.